Home Tags Articles tagged with "Events"
Color Yourself Calm is at 11 a.m. at Maricopa Public Library, 41600 W. Smith-Enke Road. Maricopa Historical Society Meeting is at 5:30 p.m. at Maricopa Public Library, 41600 W. Smith-Enke Road. Adult Co-Ed Kickball Debuts at 6:30 p.m. at Copper Sky Regional Park, 55345 W. Martin Luther King Jr. Blvd. Trip to Titan II Missile and Air & Space Museum leaves at 8 a.m. from Copper Sky Multigenerational Center, 44345 W. Martin Luther King Jr. Blvd. MUSD Kindergarten Round-up is at 5:30 p.m. at all MUSD elementary campuses. City Council Work Session is at 6 p.m. at Maricopa City Hall, 39700 W. Civic Center Plaza. Charcoal Drawing for Everyone is at 6:30 p.m. at Central Arizona College – Maricopa Campus, 17945 N. Regent Drive. Maricopa City Council Meeting is at 7 p.m. at Maricopa City Hall, 39700 W. Civic Center Plaza. Overpass Informational Meeting is hosted by ADOT at 5:30 p.m. at Maricopa Unified School District, 44150 W. Maricopa-Casa Grande Hwy. MCE Artist Reception is at 6 p.m. at Maricopa Center for Entrepreneurship, 20800 N. John Wayne Pkwy, Ste. 108. Outdoors 101 is at 6:30 p.m. at Copper Sky Multigenerational Center, 44345 W. Martin Luther King Jr. Blvd. Ram Twilight Invitational is hosted by MHS track team at 3 p.m. at Maricopa High School, 45012 W. Honeycutt Ave.
Herman’s Hermits starring Peter Noone play a free concert at Harrah’s Ak-Chin Casino, 15406 N. Maricopa Road, at 8 p.m.
2nd Saturday Market is at 8 a.m. at Copper Sky Regional Park, 44345 W. Martin Luther King Jr. Blvd. Coffee with the Chief is at 8 a.m. at Copper Sky Police Substation training room, 17985 N. Greythorne Drive. 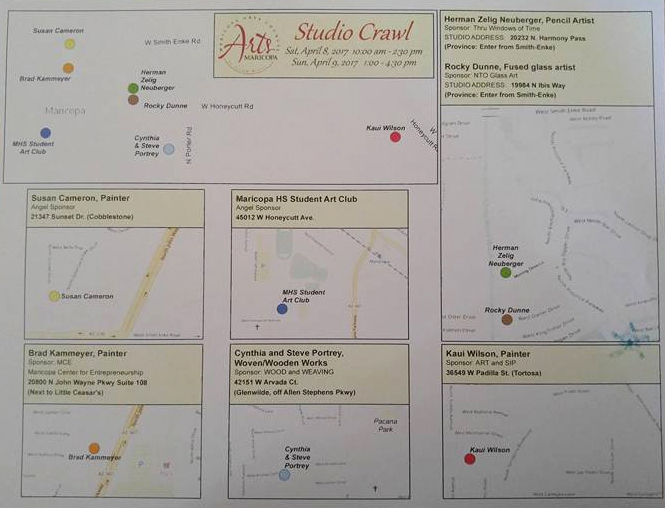 Studio Crawl No. 2 is 10 a.m.-2:30 p.m. at various locations in Maricopa. Tortosa Easter Eggstravaganza 2017 is 11 a.m.-2 p.m. at Santa Cruz Elementary School, 19845 N. Costa del Sol. Spice of Life Senior Variety Show is at 6 p.m. at Maricopa Performing Arts Center, 45012 W. Honeycutt Ave. Studio Crawl No. 2 IS 1-4:30 p.m. at various locations in Maricopa. The Christmas season is in full bloom this week in Maricopa with a sleigh-ful of events and activities for everyone while Ak-Chin’s Masik Tas continues with rodeo, parade and carnival. For details on these and other listings, or to add your own, visit InMaricopa.com/Calendar. Maricopa Historical Society Meeting meets at 5:30 p.m. at the Maricopa Public Library, 41600 W. Smith-Enke Road. M.O.R.E.E. Trip to Tombstone leaves at 8 a.m. from Copper Sky Multigenerational Center, 44345 W. Martin Luther King Jr. Blvd. Maricopa City Hall Tree Lighting Ceremony is at 6 p.m. at Maricopa City Hall, 39700 W. Civic Center Plaza. Celebrate Recovery Large & Small Group Meeting is at 7 p.m. at Maricopa Community Church, 44977 W. Hathaway Ave.
Fall Music ‘Pass in Review’ by Maricopa Unified School District student is at 7 p.m. at Maricopa Performing Arts Center, 45012 W. Honeycutt Ave.
City Council Meeting with swearing in of elected officials is at 7 p.m. at 39700 W. Civic Center Plaza. Art & Entrepreneur Artist Reception is at 6 p.m. at Maricopa Center for Entrepreneurship, 20800 N. John Wayne Pkwy, Ste. 108. Masik Tas at Ak-Chin continues for the final weekend at various location and various times. Chamber of Commerce Breakfast Mixer is at 7 a.m. at Harrah’s Ak-Chin Casino, 15406 Maricopa Road. Grupo Control with Conjunto Bravo perform a free concert at 7 p.m. at UltraStar Multi-tainment Center, 16000 N. Maricopa Road. Maricopa Homes & Businesses on Parade begins. Maricopa Chorus Christmas Concert is at 7 p.m. at Global Water, 22590 N. Powers Parkway. Easton Corbin performs in a free concert with opening act at 7 p.m. at UltraStar Multi-tainment Center, 16000 N. Maricopa Road. Breakfast with Santa is at 8 a.m. at Our Lady of Grace Catholic Church, 40929 W. Santi Road. 2nd Saturday Maricopa Market is at 8 a.m. at Copper Sky, 44345 W. Martin Luther King Jr. Blvd. Tortosa Winterfest starts at 1 p.m. at Tortosa Main Park, 36340 W. Picasso St.
DSPA Gems Sugar Plum Tea is at 2 p.m. at Saddleback Elementary School, 18600 N. Porter Road. Maricopa’s Living Nativity is at 5 p.m. at Community of Hope Church, 45295 W. Honeycutt Ave. The vocal group Home Free will perform this week at Harrah's Ak-Chin Casino. Music, dance and holiday fun are on this week’s calendar, highlighted by the start of Ak-Chin Indian Community’s Masik Tas, Maricopa’s Merry Copa Holiday Festival and Shamrock Farms’ Joy to the Herd. For details on these and other listing, or to add your own, visit InMaricopa.com/Calendar. Maricopa Planning & Zoning Meeting is at 6 p.m. at Maricopa City Hall, 39700 W. Civic Center Plaza. M.O.R.E.E. Trip to Sonoran Desert Museum leaves at 9 a.m. from Copper Sky Regional Park, 55345 W. Martin Luther King Jr. Blvd. Holiday Shopping Expo is at 3 p.m. at Arroyo Grille at Ak-Chin Southern Dunes, 48456 W. Hwy 238. Little League Board Meeting is at 7 p.m. at Pacana Park, 19000 N. Porter Road. Masik Tas at Ak-Chin gets started Dec. 1 at 4 p.m. at various locations in the Ak-Chin Indian Community. Los Garcia Bros. perform at 7 p.m. in The Lounge at Harrah’s Ak-Chin Casino, 15406 Maricopa Road. MHS Fall Dance Recital is at 7 p.m. at Maricopa Performing Arts Center, 45012 W. Honeycutt Ave.
Home Free performs at 8 p.m. in The Lounge at Harrah’s Ak-Chin Casino, 15406 Maricopa Road. Joy to the Herd is 9 am.-3 p.m. at Shamrock Farms in Stanfield. Merry Copa Holiday Festival is 2-6 p.m. at Copper Sky Regional Park, 44345 W Martin Luther King Jr. Blvd. PowerPack-Copa Chili Cook-Off is at 4 p.m. at Global Water, 22590 N. Powers Parkway. Handbell Choir Concert is at 4 p.m. at Central Arizona College – Maricopa Campus, 17945 N. Regent Drive. Even on Thanksgiving week, there is a small variety of events happening in Maricopa, from an umpire clinic, to the Turkey Trot to the inaugural Maricopa Marketplace. For details on these listings and others, or to add your own, visit InMaricopa.com/Calendar. CERT receives a new trailer in a ceremony at 3:30 p.m. at City Hall, 39700 W. Civic Center Plaza. Little League Umpire Clinic is at 6:30 p.m. at Pacana Park, 19000 N. Porter Road. M.O.R.E.E. Trip to Tonto Natural Bridge leaves at 9 a.m. from Copper Sky Regional Park, 55345 W. Martin Luther King Jr. Blvd. Maricopa Lions Club meets at 7 p.m. at the Copper Sky Police Substation training room, 17985 N. Greythorne Drive. Maricopa Turkey Trot 5K and 1-mile run starts at 7 a.m. at Pacana Park, 19000 N. Porter Road. Turkey Day Shootout golf tournament starts at 9 a.m. at Ak-Chin Southern Dunes, 48456 W. 238. Maricopa Marketplace is at 9 a.m. at Maricopa Center for Entrepreneurship, 20800 N. John Wayne Pkwy, Suite 108. Events this week include World Music Showcase, MAC Family Farm Day and Maricopa Shark Tank. Entertainment and educational events are in store for Maricopans this week, from Shark Tank to World Music Showcase to a community Fall Festival and a tour of the Maricopa Agricultural Center. For details on these listings and others, or to add your own, visit InMaricopa.com/Calendar. Maricopa Shark Tank returns from 5 to 8 p.m. at Maricopa High School, 45012 W. Honeycutt Ave. Wired: A Social Networking Event is at 8 a.m. at Maricopa Center for Entrepreneurship, 20800 N. John Wayne Parkway, Suite. 108. Lunch and Learn is at noon at Copper Sky Multigenerational Complex, 44345 W Martin Luther King Jr. Blvd. Diabetes Talk is at 3 p.m. at Maricopa Public Health Clinic, 41600 W. Smith Enke Road, Building 15. MUSD Governing Board meets at 6:30 p.m. at Maricopa Unified School District, 44150 W. Maricopa-Casa Grande Hwy. World Music Showcase is at 6 p.m. at Copper Sky Regional Park, 55345 W. Martin Luther King Jr. Blvd. Service Project in the Park is at 8 a.m. at Copper Sky Regional Park, 55345 W. Martin Luther King Jr. Blvd. MAC Farm Family Day is at 10 a.m. at University of Arizona Maricopa Agricultural Center, 37860 W. Smith-Enke Road. Maricopa Fall Festival is at 10 a.m. at Legacy Traditional School, 17760 N. Regent Drive. Things are starting to get a little spooky in Maricopa in anticipation of Halloween, and several events will be playing it up. For details on these listings and others, or to add your own, visit InMaricopa.com/Calendar. A Ray of Hope meeting of Narcotics Anonymous meets at 7 p.m. at Maricopa Community Church, 44977 W. Hathaway Ave. Bounce Boot Camp is 6-7 p.m. at Copper Sky Multigenerational Center, 44345 W. Martin Luther King Jr. Blvd. Quilting 101 is 9 a.m.-noon at Copper Sky Multigenerational Center, 44345 W. Martin Luther King Jr. Blvd. Food Biz 520 Workshop is at 5 p.m. at Maricopa Center for Entrepreneurship, 20800 N. John Wayne Parkway, Suite 108. Maricopa Unified School District Governing Board Meeting is at 6:30 p.m. at MUSD, 44150 W. Maricopa-Casa Grande Hwy. Wendy the Witch will appear at 10 a.m. at Maricopa Public Library, 41600 W. Smith-Enke Road. Estrella Gin Business Park Open House is at 5 p.m. at Maricopa City Hall, 39700 W. Civic Center Plaza. Beer Tasting from San Tan Brewery will be at Arroyo Grille at Ak-Chin Southern Dunes, 48456 W. Hwy. 238. A Ray of Hope meeting of Narcotics Anonymous is at 7 p.m at Ak-Chin Social Services, 48227 W. Farrell Road. “Passing Strange,” a Maricopa Community Theatre production of Othello, is at 7 p.m. at Maricopa High School Lecture Hall, 45012 W. Honeycutt Ave.
Big Bad Voodoo Daddy performs at 8 p.m. at Harrah’s Ak-Chin Casino, 15406 Maricopa Road. Flashback Friday at Luxe Lounge is at 10 p.m. at UltraStar Multi-tainment Center, 16000 N. Maricopa Road. UltraStar Halloween Events include haunted house, laser tag, trick or treating and an adult party at UltraStar Multi-tainment Center, 16000 N. Maricopa Road. M.O.R.E.E. Fossil Creek Backpacking leaves at 8 a.m. from Copper Sky Multigenerational Center, 44345 W. Martin Luther King Jr. Blvd. Bashas’ Halloween Party is 10 a.m.-2 p.m. at Bashas’ Supermarket, 21044 N John Wayne Parkway. 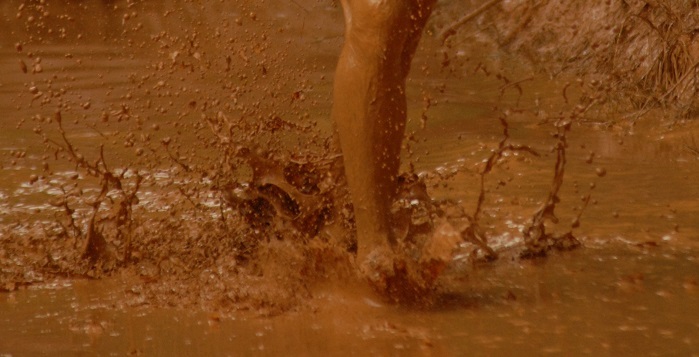 The Maricopa Mud Run is scheduled for Saturday morning. The Maricopa Mud Run highlights an active week of events in Maricopa, which also includes a Breast Cancer Awareness Battle of the Bras, an amateur radio convention and a whole lot more. For details on these and other listings, or to add your own, visit InMaricopa.com/Calendar. Weekly Grief Support Group sponsored by J. Warren Funeral Services meets at 1 p.m. at Maricopa Chamber of Commerce, 44480 W. Honeycutt Road, Ste. #106. Bounce Boot Camp is at 6 p.m. at Copper Sky Multigenerational Center, 44345 W. Martin Luther King Jr. Blvd. Desert Landscape Photography is 9 a.m. –noon at Central Arizona College – Maricopa Campus, 17945 N. Regent Drive. Coffee with Friends of the Maricopa Library is 1:30-3 p.m. at Maricopa Public Library, 41600 W. Smith-Enke Road. Maricopa City Council Work Session is at 6 p.m. at Maricopa City Hall, 39700 W. Civic Center Plaza. Maricopa 101: Shop Local – Copa Bingo info session is at 5 p.m. at Maricopa City Hall, 39700 W. Civic Center Plaza. Monitoring Your Diabetes is a presentation at 3 p.m. at Maricopa Public Health Clinic, 41600 W. Smith Enke Road, Building 15.
empower: Women and Minorities is at 6 p.m. at Copper Sky, 44345 W Martin Luther King Jr. Blvd. Country Line Dancing Workshop is at 7 p.m. at Central Arizona College – Maricopa Campus, 17945 N. Regent Drive, Room A102. State Amateur Radio Convention starts at 10 a.m. at UltraStar Multi-tainment Center, 16000 N. Maricopa Road. Flashback Friday at Luxe Lounge is 10 p.m.-2 a.m. at UltraStar Multi-tainment Center, 16000 N. Maricopa Road. Maricopa Mud Run 2016 starts at 8 a.m. at Copper Sky Regional Park, 55345 W. Martin Luther King Jr. Blvd. Take the Money and Ride is noon to 2 p.m. at UltraStar Multi-tainment Center, 16000 N. Maricopa Road. Performing Arts Gala is free at 7 p.m. at Maricopa Performing Arts Center, 45012 W. Honeycutt Ave. Pink Pool Party & Battle of the Bras starts at 7:30 p.m. at Harrah’s Ak-Chin Casino, 15406 Maricopa Road. A Concert in the Park with the Blues Review Band and a Strut Your Mutt contest is part of Domestic Violence Awareness Month. The beginning of Stagecoach Days is just part of a busy week in Maricopa, from Fall Break fun and games to live theater, a country concert and a Domestic Violence Awareness event. For details on these and other listings or to add your own, visit InMaricopa.com/Calendar. Stagecoach Days begins and will run through Oct. 24. This includes Pecan Pride at participating restaurants. Men’s Softball League starts play at 6:30 p.m. at Copper Sky Regional Park, 55345 W. Martin Luther King Jr. Blvd. Fall Break Fun & Fitness Camp is 1-5 p.m. at Copper Sky Multigenerational Center, 44345 W. Martin Luther King Jr. Blvd. Quilting 101 for ages 18 and up is at 9 a.m. at Copper Sky Multigenerational Center, 44345 W. Martin Luther King Jr. Blvd. Desert Landscape Photography is at 9 a.m. at Central Arizona College – Maricopa Campus, 17945 N. Regent Drive. Maricopa Youth Council Meeting is at 6 p.m. at Copper Sky Multigenerational Center, Multipurpose Room A, 45345 W. Martin Luther King Jr. Blvd. Mentalist Brett Barry will be at Maricopa Public Library, 41600 W. Smith-Enke Road, at 5:30 p.m.
Chamber Breakfast at 7 a.m. will be the annual Nonprofit Showcase at Harrah’s Ak-Chin Casino, 15406 Maricopa Road. Engage, a program of Maricopa Center for Entrepreneurship, is at 6 p.m. at Copper Sky Multigenerational Center, Multipurpose Room A, 45345 W. Martin Luther King Jr. Blvd. “An Ideal Husband,” a production of Maricopa Community Theatre’s Youth Theatre, is performed at 7 p.m. on Thursday and Friday, with morning and afternoon productions on Saturday, in the Maricopa High School Lecture Hall, 45012 W. Honeycutt Ave. The Gathering Place – Hemapda Ki – Open House is 3-6 p.m. at Arroyo Grille at Ak-Chin Southern Dunes, 48456 W. Hwy 238. Co-Ed Competitive Softball League starts play at 6:30 p.m. at Copper Sky Regional Park, 55345 W. Martin Luther King Jr. Blvd. Young Country performs at 8 p.m. in The Lounge at Harrah’s Ak-Chin Casino, 15406 Maricopa Road. Flashback Friday at Luxe Lounge is 10 p.m. to 2 a.m. at UltraStar Multi-tainment Center, 16000 N. Maricopa Road. Shutter Shots Photo Contest starts at midnight and runs until midnight as amateur and professional photographers shoot anything and everything that is Maricopa. Friends of the Library Annual Book Sale is at 8 a.m. at Santa Rosa Elementary School, 21400 N. Santa Rosa Drive. Tortosa Fall Festival is 2 to 5 p.m. at Tortosa Main Park, Honeycutt Road at Costa del Sol. Concerts in the Park and Strut your Mutt pet contest, featuring Bluesman Mike and the Blues Review Band is a Domestic Violence Awareness event starting at 6 p.m. at Copper Sky Regional Park, 44345 Martin Luther King Jr Blvd. The Maricopa City Council is considering an expansion of allocated space for beer sales and consumption at city festivals after hearing a proposal during their work session on Sept. 20. Special Events Manager Niesha Whitman presented arguments for a larger beer garden during city sponsored festivals at Copper Sky Regional Park. The city has a contract with the local restaurant Native Grill & Wings to serve beer at the events. Though the company doesn’t always turn a profit on their investment in the events, the city still receives 25 percent of overall sales. Whitman suggested that by allowing a larger area to mingle and roam, event goers will be more likely to partake in the libations, thus increasing the city’s cash take from these events. Expanding the beer garden, however, would require an initial investment from the city. The city would need to purchase 3,000 linear feet of fencing at a cost of $20,565.68 to comply with an ordinance that prohibits “public” consumption of alcohol. By fencing off the events, the city is also able to tally a more accurate headcount for attendance at the events. A more modest proposal of only 2,100 linear feet of fence was also made. However, exact cost was not discussed. Councilmembers Vincent Manfredi and Nancy Smith supported the smaller proposition which, though still much larger than the previous beer garden, would allow for more “family friendly” space at the festivals. According to Whitman’s presentation, renting the fence would cost the city about $3,500 per event, thus with more than four events a year the fence would theoretically pay for itself after only two years of use. The temporary fence also has the added benefit of being used for any number of other city events in Copper Sky or elsewhere. Possible $1 beer garden entry fees were discussed along with the idea of drink tickets. Though nothing was approved the idea of the expansion seemed to garner unanimous support and is likely to move forward. It’s a big Homecoming Week for Maricopa High School, and there are lots of other activities for everyone in Maricopa, from a presentation on the Juan Bautista de Anza Trail to a Mad Hatter Tea Party. For details on these and other local events, or to add your own, visit InMaricopa.com/Calendar. A Ray of Hope meeting of Narcotics Anonymous is at 7 p.m.at Maricopa Community Church, 44977 W. Hathaway Ave.
Juan Bautista de Anza National Historic Trail Presentation by BLM archaeologist Cheryl Blanchard is at 5:30 p.m.at Maricopa Public Library, 41600 W. Smith-Enke Road. MHS Homecoming Laser Tag Showdown starts with registration at 5:30 p.m. at UltraStar Multi-tainment Center, 16000 N. Maricopa Road. Men’s Softball League play starts at 6:30 p.m. at Copper Sky Regional Park, 55345 W. Martin Luther King Jr. Blvd. Social Buzz with Kim Yuhl (through Maricopa Center for Entrepreneurship) is at noon at Copper Sky Multigenerational Center, 44345 W. Martin Luther King Jr. Blvd. Coffee with Friends of the Maricopa Library starts at 1:30 p.m. at Maricopa Public Library, 41600 W. Smith-Enke Road. MHS Homecoming Week Powderpuff Football is at 6:30 p.m. at Maricopa High School, 45012 W. Honeycutt Ave.
Job Fair at Phoenix Premium Outlets is 9 a.m.-4 p.m. at the outlets at Wild Horse Pass at 4976 Premium Outlet Way, Chandler. RamFest for Homecoming Week kicks off at 6 p.m. at Copper Sky Regional Park, 55345 W. Martin Luther King Jr. Blvd., followed by alumni football and the bonfire. MHS Homecoming Parade is at 5 p.m., starting at Maricopa Wells Middle School, 45725 W. Honeycutt Ave.
Co-Ed Novice Softball League starts play at 6:30 p.m. at Copper Sky Regional Park, 55345 W. Martin Luther King Jr. Blvd. MHS Homecoming Football Game against Ironwood is at 7 p.m. at Ram Stadium, Maricopa High School, 45012 W. Honeycutt Ave. Piano Man – Billy Joel/Elton John Tribute is at 8 p.m. and 10 p.m. at Harrah’s Ak-Chin Casino, 15406 Maricopa Road. Flashback Friday at Luxe Lounge is from 10 p.m. to 2 a.m. at UltraStar Multi-tainment Center, 16000 N. Maricopa Road. ATA Women’s Self-Defense is a presentation at 11 a.m. at Sunrise TaeKwonDo, 44400 W. Honeycutt Road. Import and Drift Car Show starts at 1 p.m. at Wild Horse Pass Motorsports Park, 20000 S. Maricopa Road, Chandler. Mother/Daughter Mad Hatter Tea Party for DSPM Gems is at 1:30 p.m. at Saddleback Elementary School, 18600 N. Porter Road. Children and adults have events this week, ranging from Kids Day Maricopa to a free David Lee Garza performance to prostate cancer screening and a General Election Debate Forum. For details on these listings and others, or to add your own, visit InMaricopa.com/Calendar. Weekly Grief Support Group meets at 1 p.m. at Maricopa Chamber of Commerce, 44480 W. Honeycutt Road, Ste. #106. K&Q Re-Opening Ribbon-cutting is at 5:30 p.m. at its new location, 20800 N. John Wayne Parkway, Suite 104. MHS Homecoming Planning Meeting is at 5 p.m. at Maricopa High School, 45012 W. Honeycutt Ave.
Premier Orthodontics Book Launch Party is from 5:30 to 6:30 p.m. at 21083 N. John Wayne Parkway, C105. Maricopa Unified School District Governing Board Meets at 6:30 p.m. at the district office, 44150 W. Maricopa-Casa Grande Hwy. Plein Air Painting Class is at 8 a.m. at Central Arizona College – Maricopa Campus, 17945 N. Regent Drive. 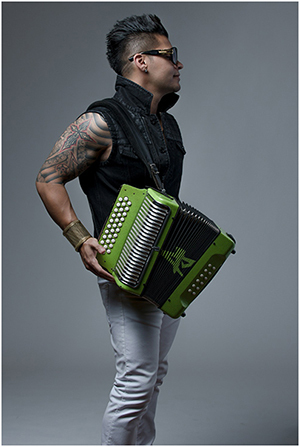 David Lee Garza y Los Musicales perform at 7 p.m. in The Lounge at Harrah’s Ak-Chin Casino, 15406 Maricopa Road. “Crowned” LLLace Women & Teen Conference starts at 7 p.m. and runs through Saturday at Leading Edge Academy, 18700 N. Porter Road. General Election Debate Forum featuring candidates for the state Legislature, city council, sheriff, assessor and Congress is 8-10 a.m. at UltraStar Multi-tainment Center, 16000 N. Maricopa Road. Kids Day Maricopa is from 10 a.m. to 4 p.m. at Maricopa Wells Middle School, 45725 W. Honeycutt Ave.
Coffee with the Superintendent to learn about the upcoming override election is at 10 a.m. at Maricopa Unified School District, 44150 W. Maricopa-Casa Grande Hwy. ATA Bullying Prevention is a free program at 11 a.m. at ATA Martial Arts, 44400 W Honeycutt #103. Central Arizona College is hosting a blood drive. It’s a light week of activities as Maricopa heads into Labor Day Weekend. For details on these listing and more, or to add your own, visit InMaricopa.com/Calendar. Men’s Softball League plays at 6:30 p.m. at Copper Sky Regional Park, 55345 W. Martin Luther King Jr. Blvd. 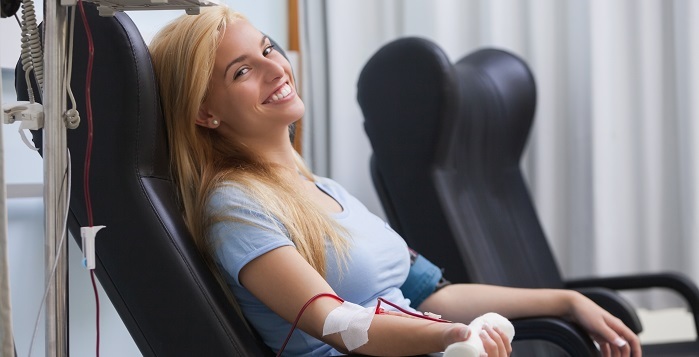 CAC-Maricopa campus blood drive is from 8:30 a.m. to 12:30 p.m. at Central Arizona College – Maricopa Campus, 17945 N. Regent Drive. Coffee with Friends of the Maricopa Library begins at 1:30 p.m. at Maricopa Public Library, 41600 W. Smith-Enke Road. 2017 Relay For Life Interest Meeting is at 6:30 p.m. at Leading Edge Academy, 18700 N. Porter Road. Co-Ed Novice Softball League plays at 6:30 p.m. at Copper Sky Regional Park, 55345 W. Martin Luther King Jr. Blvd. Co-Ed Competitive Softball League plays at 6:30 p.m. at Copper Sky Regional Park, 55345 W. Martin Luther King Jr. Blvd. Asleep at the Wheel performs at 8 p.m. in The Lounge at Harrah’s Ak-Chin Casino, 15406 N. Maricopa Road. Country icon Dwight Yoakam will perform free Thursday at 7 p.m. This week is filled with Christmas and Masik Tas events. For details on these and other events, or to add your own, go to InMaricopa.com/Calendar. Masik Tas Menudo Contest is from 4:30 to 6 p.m. at the Old Valla site, Ak-Chin Indian Community. Meet Santa and Mrs. Claus at the Southwest Pole from 6-8 p.m. at 44267 W. Cypress Lane. Pearl Harbor Day Flag-Raising is at 8 a.m. at Maricopa Veterans Center, 44240 W. Maricopa-Casa Grande Highway. Coffee with Friends of the Maricopa Library starts at 1:30 p.m. Meet every Tuesday for refreshments and conversation and get acquainted with the library. All ages welcome. Dwight Yoakam is in a free concert in the grassy Ak-Chin Circle field north of the UltraStar Multi-tainment Center. Opening act starts at 5:30 p.m., followed by Dwight Yoakam at 7 p.m. Fireworks follow the show. All-Indian Men’s & Women’s Basketball Tournament is hosted by Ak-Chin Parks and Recreation. Masik Tas Celebration Golf Tournament starts at 10 a.m. at Ak-Chin Southern Dunes in a four-player scramble. Masik Tas Junior Rodeo starts at 10 p.m. in the Ak-Chin arena west of UltraStar Multi-tainment Center for four age divisions. A.J. Castillo is in a free concert at Ak- Chin Circle field north of the UltraStar Multi-tainment Center at 7 p.m. Gates open at 6 p.m.
Maricopa Music Circle performs its Winter Serenade at 7:30 p.m. in the Black Box Theater at Maricopa High School’s Performing Arts Center. Masik Tas Carnival in the west parking lot at UltraStar Multi-tainment Center is Friday 5-10 p.m., Saturday 12-10 p.m., Sunday 12-6 p.m.
Meet Santa and Mrs. Claus at the Southwest Pole Fridays and Saturday 6-9 p.m. and Sundays 6-8 p.m. at 44267 W. Cypress Lane through Dec. 20. Shop with a Cop, an annual event with Maricopa Police Department and underprivileged children starts at 6 a.m. with a trip to Walmart. VEX Robotics Competition is a first-ever event for Maricopa High School, with competition starting at 9 a.m.
Stagestop Marketplace Holiday Boutique is from 9:30 a.m. to 2 p.m. at the Rustic Rose Barn. MFD Ride for Toys is 10 .m.-2 p.m. at Pacana Park. Donate toys for a ride on a fire truck and raffle ticket. Masik Tas Rodeo starts at 1 p.m. at the Ak-Chin arena west of UltraStar Multi-tainment Center. The Nutcracker Ballet will be performed in excerpts by the DSPA Pearls Ballet Company for the Sugar Plum Tea at Saddleback Elementary School. Living Nativity, an annual Christmas event at Community of Hope Church on Porter Road, is from 5 to 8 p.m.
Maricopa's third annual Mud Run is Saturday at Copper Sky. A modified version pitting MHS students against faculty for Homecoming week is scheduled for Thursday. It is Paint the Town Red week, but Maricopa High School’s many Homecoming-related activities are not the only events in town this week. For more information on these and other events happening this week, or to add your own, visit InMaricopa.com/Calendar. Age-Friendly Maricopa Advisory Committee meets at 4 p.m. at Maricopa City Hall, 39700 W. Civic Center Plaza. The committee will receive an overview of the Town of Florence Community Center & Library by Council, discuss a possible tour of Our Lady of Grace Catholic Church site and discuss other issues. Kaui Wilson’s Art & Sip comes to Maricopa Center for Entrepreneurship, 20800 N. John Wayne Parkway, Ste. 108, at 5:30 p.m. Learn to paint a Kaui image and bring your own beverage. Cost is $30. Powder Puff Football is at 6 p.m. at Ram Stadium, Maricopa High School, 45012 W. Honeycutt Ave., as part of Homecoming Week. Paint the Town Red. Transportation Advisory Committee meets at 6 p.m. at Maricopa City Hall, 39700 W. Civic Center Plaza. The Committee shall discuss and make a recommendation on the proposed final Transportation Master Plan and Regional Connectivity Plan, including estimated costs associated with Recommended Roadway and Infrastructure Improvements. Coffee with Friends of the Maricopa Library is at 1:30 p.m. at the library, 41600 W. Smith-Enke Road. Meet every Tuesday for refreshments and conversation and get acquainted with the library. All ages welcome. Maricopa City Council meets for a work session at 6 p.m. and a regular session at 7 p.m. at Maricopa City Hall, 39700 W. Civic Center Plaza. Work Session items: President’s Task Force on 21st century policing and a proposed Maricopa Historical Society display. Regular session items: A resolution finding existence of a “Slum or Blighted Area” in the city and declaring the necessity for redevelopment and a presentation by Maricopa Arts Council for a proposed artwork display at City Hall. RamFest Homecoming Celebration is from 5 to 9 p.m. at Copper Sky Regional Park, 44345 W Martin Luther King Blvd. The evening includes an alumni football game, snake walk and bonfire, with music and food. J.A.M.E.S. Home Baked Goods, LLC Ribbon Cutting Ceremony is at 5 p.m. at Maricopa Chamber of Commerce, 44480 W. Honeycutt Road, Ste. #106. There will be appetizers, treats and drinks. Veteran’s Education Benefits will be presented in four sessions, the earliet at 9 a.m., at Central Arizona College, 17945 N. Regent Drive, Room A101, with key tips and information for a smooth VA certification process for Spring 2016. “Wild West” Fall Festival is at 7 p.m. at Children’s Learning Adventure, 20600 N. John Wayne Parkway, with games, prizes, classroom activities and treats. Coffee ‘On the Porch’ at Maricopa Public Library, 41600 W. Smith-Enke Road, is at 9 a.m. every third Thursday of the month at Maricopa Public Library. Enjoy our wonderful Arizona weather while you sip coffee, eat cookies and meet your neighbors and Library Manager Erik Surber. Staff v. Student Mud Run is at 7 p.m at Copper Sky Regional Park, 44345 W. Martin Luther King Jr. Blvd., as part of Maricopa High School’s Homecoming Week. Maricopa High School Homecoming is at 6 p.m. at Ram Stadium – Maricopa High School, 45012 W. Honeycutt Ave. The game against Vista Grande kicks off at 7 p.m.
Mud Run, a third annual event in Maricopa, starts at 8 a.m. at Copper Sky Regional Park, 44345 W. Martin Luther King Blvd., is in multiple heats, including competitive, recreational, youth/teen. Registration closes Oct. 24. Adult Registration will cost $20, and youth/teen will be $15. There will be no group registration for this event. Family Hoedown Fund-Raiser for DSPA Gems is a new event from 3 to 6 p.m. at Elements Event Center at Ak Chin Circle, 16000 N. Maricopa Road. Western BBQ Buffet, Line Dancing Lessons, Western Games, Family Photos, DJ and Live Entertainment, all for $20 for adults and $12 for children age 10 and under. DSPA (Desert Sun Performing Arts) Gems fund-raises to provide tuition grants for performing arts classes to children who would otherwise not be able to afford to attend. Pack 997 Pumpkin Patch Fundraiser is from 4 to 8 pm. at Rotary Park, 44150 W Maricopa-Casa Grande Highway. There will be pumpkins, games and prizes, pictures and food. Cost: $0.50 per ticket for games; $5 Pumpkins. Concert in the Park starts at 6 p.m. at Copper Sky Regional Park, 44345 W. Martin Luther King Blvd., this time a Western Fusion 80’s Night. Maricopa High School Homecoming Dance is from 8 to 11 p.m. in the school cafeteria, 45012 W. Honeycutt Ave.
October is a busy month for events in Maricopa, and things are just kicking into gear this week. See details on the following events and others, or post your own, on our online calendar at InMaricopa.com/Calendar. Coffee with Friends of the Maricopa Library is from 1:30 to 3 p.m. at the library, 41600 W. Smith-Enke Road. Meet every Tuesday for refreshments and conversation and get acquainted with the library. All ages welcome. Maricopa City Council meets at 7 p.m. at Maricopa City Hall, 39700 W. Civic Center Plaza. Besides a full consent agenda, the council will also make appointment to the Youth Council and proclaim Paint the Town Red Week and Ram Pride Day. Art on the Veranda Preview Show is from 6 to 8 p.m. at Maricopa Center for Entrepreneurship, 20800 N. John Wayne Pkwy, Ste. 108. Get an early look at the Maricopa Artisans showcase that comes to town in November. Chamber of Commerce Breakfast is at 7 a.m. at Harrah’s Ak-Chin Casino Ballroom, 15406 N. Maricopa Road. October is Give Local Month, and the Chamber will recognize eight local nonprofit organizations. Sessions with the Supervisor is a local information meeting for the Hidden Valley, Thunderbird Farms and Papago Butte area and County Supervisor Tony Smith. It starts at 4 p.m. at the Public Works facility, 43910 W. Meadowview Road. Mysterious Halloween Mansion Mayhem registration deadline is at 6 p.m. at Maricopa City Hall. The City of Maricopa would like to engage all residents in a hauntingly good time, by recognizing and appreciating all of the efforts put into great holiday home decorating. Participants are encouraged to be original and creative with decorating the exterior of their home with timelessly spooky Halloween characters, scenes and props. Prizes are awarded. Austin Webb is in concert at 8 p.m. in The Lounge at Harrah’s Ak-Chin, 15406 Maricopa Road. The up-and-coming country singer-songwriter comes to the casino for a free show. Pecan Pride Celebration kicks off Stagecoach Days events as participating restaurants serve special pecan-based dishes for two weeks. Let’s Take a Hike, with InMaricpa’s outdoors correspondent Misty Newman, is a gathering that leaves at 7 a.m. from Copa Craze, 21116 N John Wayne Pkwy Suite B10, for an adventure on South Mountain. Copa History Hunt registration is from 9 a.m. to noon at the Large Group Ramada at Copper Sky Regional Park. The five-day event is a photo scavenger hunt for Maricopa’s historical objects and places, part of Stagecoach Days. Community events, kids’ activities and public meetings mark this week in Maricopa. Tuesday is particularly busy. Friends of the Maricopa Public Library meet at 5:30 p.m. to discuss and plan projects in support of the library. New members are welcome. MHS Homecoming Committee meets at 5 p.m. in the school library. It’s getting down to the wire as the school plans to mark its 60th year for Homecoming during Stagecoach Days. All are welcome to volunteer. Preschool Storytime is at 9:30 a.m. at the Maricopa Library. Discover new stories, rhymes, flannel boards, and songs in this active, fun-filled, half-hour program designed to help build early literacy skills as your child gets ready to read. Coffee with Friends of the Library starts at 1:30 p.m. at the Maricopa Library in an open discussion with coffee and refreshments. All are welcome to attend. Central Arizona College Board meets on the Maricopa campus at 2 p.m. in the Community Room (A101). Tale Waggers, a library group for struggling readers and animal lovers, meets at 3:30 p.m. in the Maricopa Library. Come read to PJ the Dog. J.R.O.T.C. McDonald’s Night is from 4:30 to 7:30 p.m. at McDonald’s, 20700 N. John Wayne Parkway, with a portion of sales supporting Maricopa High School’s Air Force JROTC. Read ‘Em & Eat is a tween book club for ages 9-12, meeting at 5:30 p.m. in the Maricopa Library. This month’s selection is “The Willoughbys” by Lois Lowry. Maricopa City Council Meeting starts at 7 p.m. at City Hall. The regular agenda includes an imposition of rental fees for the aquatic center at Copper Sky. City Council meets the first and third Wednesday of the month. Let’s Put Maricopa on the Map is a workshop at Maricopa Center for Entrepreneurship starting at 10 a.m. and again at 6 p.m. Ketalog in partnership with Google and StartLogic will help participating business owners build their website and get it registered to be found on Google. Maricopa High School Girls’ Golf hosts Apache Junction at The Duke at Rancho El Dorado starting at 3 p.m.
Reading Rebels, a young adult book club, meets at 5:30 p.m. in the Maricopa Library. This month’s selection is “The Diviners” by Libba Bray. S.M.A.R.T. Kids meet at 2:30 p.m. at the Maricopa Library. The program is for children in grades 3-6, ages 8-12. The focus is on science, math, art, and technology. Fun Van shows up Maricopa Library at 9 a.m., 11:15 a.m. and 2:15 p.m. (online registration required). Kids play and learn while parents and caregivers meet to discuss parenting skills. CAC Flu & Pneumonia Shots will be dispensed at 3:15 p.m. in Room A102 of the Maricopa Campus of Central Arizona College. Maricopa High School Volleyball hosts Florence at 6 p.m., preceded by freshman and JV matches. L’il Explorers meet at 10 p.m. at the Maricopa Library for stories, music, rhymes and activities for toddlers’ active learning styles. Ages 2-3. Heritage District Citizens Advisory Committee meets at 5:30 p.m. at Fire Station 575. POW-MIA Recognition Day will be marked by the VFW at 8 a.m. at the Maricopa Veterans Center. Honor those missing in action by joining us for a flag raising and indoor ceremony that explains the significance of the Missing Man Table. Maricopa Pet Adoption Event runs from 8 a.m. to noon at The Pet Club.Pinal County Animal Care and Control will have a nice selection of adoptable animals. Kids Day Maricopa returns with activities from 10 a.m. to 4 p.m. at Maricopa Wells Middle School. Police and fire personnel, PCSO’s helicopter, former NBA star A.C. Turner, local musicians Laura Walsh and Joanna Joy, Smokey Bear, food and much more included. Booboo Stewart returns to meet his Maricopa fans at 3:30 p.m. at UltraStar Multi-tainment Center, and 125 lucky people will be chosen randomly to receive two tickets for a private showing of Disney Descendants followed by an exclusive Q&A with Booboo Stewart. To learn more about these and other events, or to add your own to our online calendar, see InMaricopa.com/Calendar.